This is the 6th installment of the Adventure of the Elected Man. “You notice many things amiss with your own doctrine, yet it surprises me that these paradoxes do not cause you to go back to the Scriptures and rethink your creed.”, Holmes said. “Now, it is one thing to refute another man’s doctrine, but a very different matter to establish your own view. It is very easy to knock over one man’s hypothesis concerning these truths, not quite so easy to make your own stand on a firm footing.”, Spurgeon challenged. I could see that Holmes was in his element as he grinned and rubbed his hands together. “If God chose to dispense grace based on anything good in man, why we would all be left unchosen. God is sovereign and He does as He wills and givest no account of the matters. To make election conditional is to rob God of His sovereignty. By what means do you bind God such that He cannot give grace to any He chooses, which is within His absolute right?” Spurgeon asked. “I do not bind God nor limit His sovereignty. Salvation is conditional, is it not?”, Holmes did not wait for an answer but continued his discourse. “Of course it is, for we read ‘believe in the Lord Jesus Christ and you will be saved’. The condition is faith. Now, if salvation is based on the condition of faith, then election to salvation must also be based on this same condition. God, as sovereign, has made an unalterable decree. That decree was to offer salvation through faith, and it can be summarized in these words: he that believeth shall be saved; he that believeth not shall be condemned. In this one decree we have joined together both election and reprobation. This decree was made by God, who as you say was well within His rights to do so.”, Holmes replied. “Faith is a choice, not a gift. Man is free to make choices, for God created him as a morale agent. It is upon this fact that we base the idea of responsibility. Now when man is presented with the sincere offer of good news and an invitation to come, he must choose between accepting the message by faith and coming to Jesus or rejecting the message and remaining in a state of unbelief.”, Holmes explained. “You would imagine that if God gave salvation to any he would wait until he found them earnestly seeking him and exercising faith. You would imagine that God in the highest heavens would say, ‘I have mercies, but I will leave men alone, and when they feel their need of these mercies and seek me diligently with their whole heart, and come to Me by faith, then will I bless them, but not before.’ My dear Holmes, God saith no such thing. Men do not seek God first; God seeks them first! Your faith will not be the cause of your salvation, but rather the effect of your having been saved by the grace that God has given to you.”, said Spurgeon. 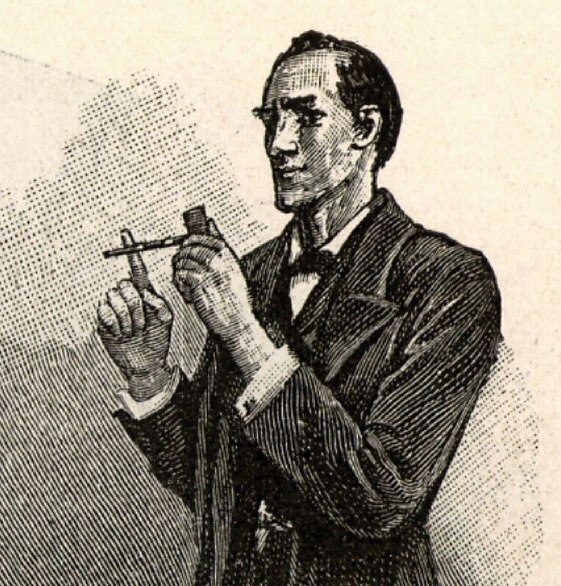 “Now, I admit that man in his natural state does not possess the ability to exercise saving faith.”, Holmes acknowledged. “God must give grace prior to the choice being made. This prevenient grace enables a person to have both the freedom and the ability to choose. Now, keep in mind that this gift of grace is not faith, nor does it cause faith in the person. It is a gift that makes faith possible without causing faith to be an inevitable result. A person must still choose. A person must choose between life and death, between a blessing and a curse, whether to walk down the narrow path or the wide path. They must accept by faith the forgiveness and freedom God offers in Christ or reject His Son and accept the condemnation that awaits them.”, Holmes offered. “But is it not all idle talk, even to consider for a single moment the absurd idea that man can fetter his Maker. You speak as if God must be the slave of men. Shall the purpose of the Eternal be left contingent on the will of man? Shall man be really his Maker’s master? Shall free-will take the place of the divine energy? Shall man take the throne of God, and set aside as he pleases all the purposes of Jehovah—compelling him by merit to choose him? I will have none of it.”, Spurgeon prodded, having construed all that Holmes said as a rejection of the sovereignty of God. “Faith is not meritorious because it is a gift. Faith, wherever it exists, is in every case, without exception, the gift of God and the work of the Holy Spirit. Faith is not possible in human nature till it is renewed. When faith exists it is not the cause but rather the proof that a person has been regenerated and saved.”, said Spurgeon. At this question, Holmes laughed to such a degree that both Spurgeon and I felt he may very well have lost his mind. When Holmes had regained some composure he offered an explanation. I’ve been kicking the idea of a Holmes-Spurgeon encounter around for a while, particularly since Conan Doyle never saw fit to even mention the Prince of Preachers. This one was not exactly what I envisioned, but it is very well done. Thank you. Thanks, appreciate the note. I am a huge Holmes fan and writing this was a lot of fun. Let me know if you ever tackle your idea. Would love to see what you do with it.